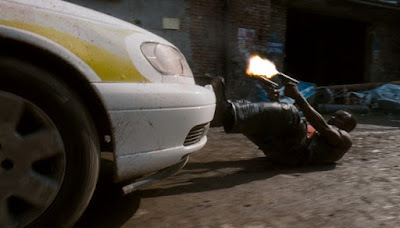 Very few action movies caught my attention. This is one of those that did catch my attention. Very humble line-ups but did the job for me. I dare to say, this movie made me lose interest in another movie; GAMER which has a similar plot. Action movies...I usually expect shady storyline and bad acting or its too gory to watch. Well, the gory part still exist in this movie. You must have the guts to stomach the scenes. The fighting scenes are awesome. Kelly Hu (Lai Lai Zhen) did well on the martial art part but f***ed up a lil on being 'foreigner' part. She is obviously American/Hawaiian and can't really fake the accent. On the other hand, Robert Carlyle (Father McAvoy) was hilarious. I loved him in Trainspotting and The Full Monty and many many more movies. If you like action movies, this is the movie to watch. There were a few times when I almost screamed (its a big deal if I scream ok). If you don't, 'forget about it'. Lastly, my dad loves this movie. Who can argue with my Dad? Ha ha. Enough said, its a GO SEE. Enjoy the movie!